The Extech wireless BR 250 borescope is an excellent investment to provide image and video of inaccessible areas on your job sites. Built in features, coupled with industry leading design technology, make this a great addition to your equipment line up. Improve the precision of your bidding process, eliminate the guesswork and avoid unwanted hiccups on the job with a reliable inspection tool by Extech! The BR 250 is a 9 MM camera and displays on a 3.5 inch LCD color monitor. Detach the screen for even more flexibility, and view images and video from up to 32 feet away from the actual borescope. Use the LCD screen, or view the footage and images two additional ways – download them to your computer or stream over a VOIP connection (optional accessory needed). The BR 250 includes the MicroSD card that stores the images and video, as well as the SD adaptor, and the USB cable. Use the SD card and adaptor to transfer directly to your computer, or use the USB cable to plug in as a second option. View video on Windows Media Player, each with a date and time stamp to assist with accurate record keeping. The BR 250 has menus in 10 different languages, and the camera head itself is waterproof. 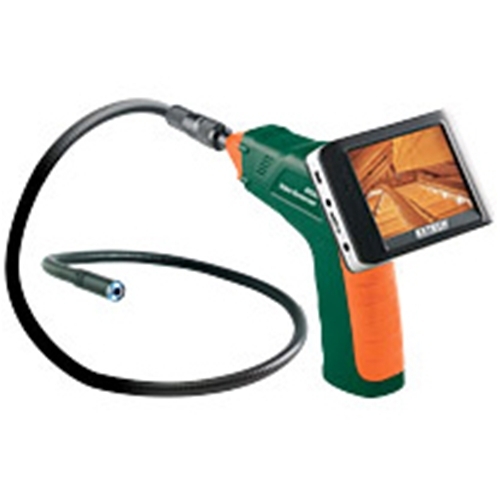 Featuring 4 LED lights, use this borescope in even dark spaces. The glare free screen provides a close up view, and the 9 MM camera provides high res viewing. Order your Extech BR 250 today, or call the pros here at Intech Equipment and Supply for additional information regarding accessories for this and all other borescope models by Extech. View the BR 200 here.